As CS Salernum, fitted out for oceanographic and hydrographic work as well as cable laying. 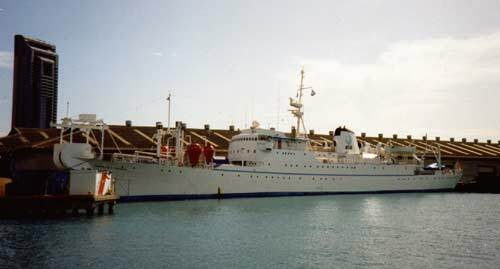 Sold in 1984 to Transoceanic Cableship Co., a subsidiary of AT&T, and renamed Charles L Brown. Used for cable repair until 2003, when she was scuttled to form an artificial reef off the island of St. Eustatius in the Caribbean. stamp is CS Salernum, later CS Charles L Brown. The vessel in the foreground is CS Mercury.